With many lives being taken and other lives put on hold for quite a while, it fills us with pride to see Syrians who have had the opportunity to be elsewhere shine with their remarkable accomplishments. Let’s take a break from the bleak headlines and take a moment to celebrate these inspiring Syrians. At the age of 22, Saad is currently a Stanley Cup-winning professional ice hockey player for the Chicago Blackhawks of the National Hockey League in America. He has been playing professionally since the age of 18, achieving a number of titles and personal bests. He was named Candian Hockey League Player of the Week and team captain of the Saginaw Spirit for the 2011-12 OHL season. He finished the league that year with 1.73 points-per-game. It doesn’t stop there, Saad was later named CCM/AHL Player of the Week for earning six points in three games with two winning points and the Blackhawks named Saad to the starting roster for the lockout-shortened 2012-13 season. He scored his first career NHL goal in February 2013 and a game-winning goal, securing the Blackhawks an NHL record of 17 straight winning games. 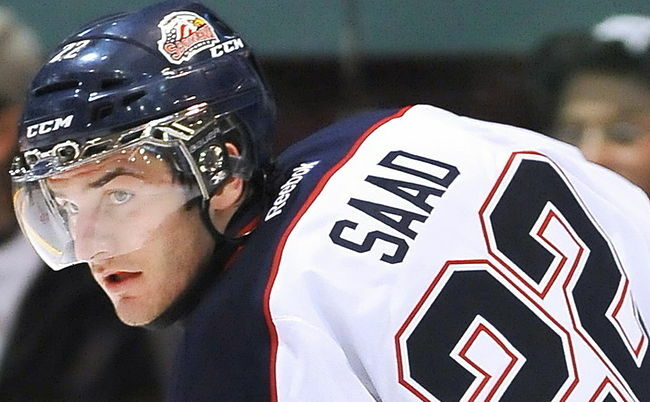 Saad was also named finalist for the Calder Memorial Trophy and won his first Stanley Cup in June 2013. Louay M. Safi is a prolific author and frequent speaker on Middle East issues, peace, leadership, and Islam and the West. He is also an advocate of human rights and civil liberties. He is the author of 11 books and numerous papers, and a speaker on questions of leadership, democracy, Islam and the Middle East. Safi is also a chairman of the Syrian American Council and testified in front of the Tom Lantos Human Rights Commission on Syria. He taught at Wayne State University and served as Associate Professor of Political Science at the International Islamic University of Malaysia. He also served as Visiting Professor at George Washington and participated in numerous national and international forums and conferences. Fawwaz T. Ulabyis is a Professor of Electrical Engineering and Computer Science at the University of Michigan and formerly the Founding Provost and Executive Vice President of the King Abdullah University of Science and Technology (KAUST) and Betty Williams Professor of Electrical Engineering and Computer Science at the University of Michigan. He is most famous for the development of micro-electronics for a suite of circuits and antennae for THz sensors and communication systems. Professor Ulaby is a member of the U.S. National Academy of Engineering, Fellow of the American Association for the Advancement of Science (AAAS) and Fellow of the Institute of Electrical and Electronic Engineers (IEEE). He received the 2000 William T. Pecora Award in recognition of his achievements as a pioneer and leading authority in the field of radar remote sensing and the Arthur Thurnau Professor Award for outstanding contributions to undergraduate education, as well as the Core Technology Alliance Recognition Award and many more awards in honour of his esteemed work. Diana Al Hadid is a contemporary artist who lives and works in New York. She earned a BFA in Sculpture and BA in Art History from Kent State University in 2003 and an MFA from Virginia Commonwealth University in 2005, and attended the Skowhegan School of Painting and Sculpture in 2007. She’s a resident at the USF Institute for Research in Art, Artist-in-the-Marketplace Program at the Bronx Museum, Vermont Studio Center and Sculpture Space. She has received many awards and honors including grants from The Joan Mitchell Foundation in 2001, Pollock-Krasner Foundation in 2007, Rockefeller Fellow and Louis Comfort Tiffany Foundation in 2009, Nucci Award and United States Artist in 2010. Yasser Seirawan is a chess Grandmaster and four-time United States champion. He was also winner of the World Junior Chess Championship in 1979. In 2007, Seirawan had an Elo rating of 2634, making him one of the top 100 chess players in the world and 4th place in America. Seirawan is also a published chess author and commentator. Nadeen Aljijakli is an immigration attorney who runs her own practice in Ohio and New York. She is a member of the American Immigration Lawyers Association (AILA). She has worked on a number of asylum cases representing mothers, doctors, students and activists forced to seek refuge in the U.S. and focuses on complex deportation and removal defense, asylum and family-based immigration. Known by the pen name Adonis, Esber is a Syrian poet, essayist and translator. He has written more than twenty books and volumes of poetry in the Arabic language as well as translated several works from French. He was imprisoned in Syria in the mid-1950s as a result of his beliefs, and therefore settled abroad to pursue his career largely in Lebanon and France. Adonis is a perennial contender for the Nobel Prize in Literature. He has been regularly nominated for the award since 1988 and has been described as the greatest living poet of the Arab world. Assala is a Syrian singer best known for her album Sawaha Galbi, which stayed top of the Syrian music charts for four weeks in 2007. She began performing at the age four and helped care for her siblings after the death of her father. The King of Bahrain granted her citizenship to Bahrain after being impressed by her performance of “Love and Loyalty”. Assala hosted a television program, Soula, on Dubai TV. The show presents guest musicians as though they were visiting Assala in her home. She is one of the most well known artists in the Middle East and is well loved by fans.